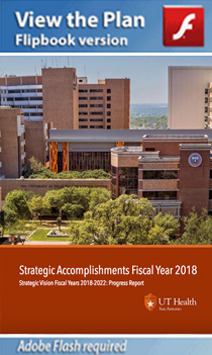 The University of Texas Health Science Center at San Antonio (UT Health San Antonio) is a comprehensive and leading academic center in South Texas. Because of the efforts of the faculty, staff and students and our community partners, collaborations and partnerships are essential to our success. 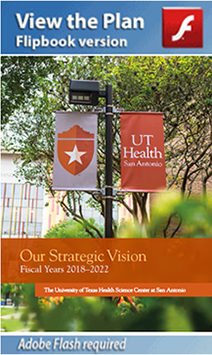 Our ambition is for UT Health San Antonio to be recognized among the elite academic health centers in the world to transform health and health care for a diverse society. We have achieved important milestones through the implementation of our 2013–2017 strategic plan. We have a strong foundation of success upon which to grow, as evidenced by our vibrant community, faculty, staff and students. The Strategic Plan outlined herein for fiscal years 2018-2022 serves as a compass for us to continue to build upon our success. It provides a plan of action while requiring ongoing assessments of progress. With your continuing support, we will reach our goals in all of the mission areas: education, research, health care, community engagement and a culture of excellence. Thank you for traveling on this exciting journey with us.